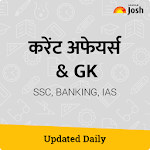 Study latest Current Affairs in Hindi from India’s No.1 Education & General Knowledge (GK) website JagranJosh.com. Best coverage of daily Current Affairs in Hindi for 2018 & previous year’s current affairs for all govt. exam preparation. 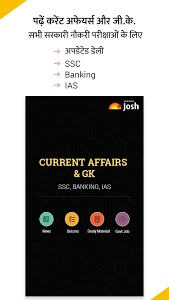 Study current affairs by category & practice your daily Current Affairs & GK Quizzes. Available in both Online & offline mode. With over 1 Million downloads, it’s the most trusted app for Latest Current Affairs in Hindi & GK Quiz app for govt. exam preparation. 1. Daily & Weekly Current Affairs Recaps, in less than 100 words. 2. Study Latest Current Affairs in Hindi & GK Topics by categories: National, International, Science & Technology, Corporate, Sports, Environment and Ecology. 4. Offline mode: Study Current Affairs & GK in offline mode and works fast even in 2G network. 5. General Knowledge (GK): Study GK (General Knowledge) by category & extensive GK Lists. Get GK explanations for different topics updated daily along with daily gk quiz for any govt. exam preparation. 6. Latest Current Affairs in Hindi Videos & Study Guides: Exclusive, simple to follow Weekly Current Affairs videos in Hindi. Study Guides available for all govt. exam preparation. 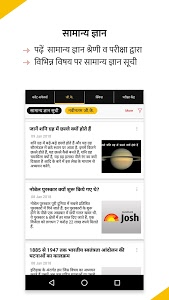 In addition, the Current affairs & GK in Hindi app also releases Weekly Current Affairs Videos that highlight the most important current affairs of the week. The video contains brief pointers that help the students boost up their competitive exam preparation. Category wise Current Affairs & GK. Similar to "Daily Current Affairs in Hindi for govt exams"